Pioneers in the industry, we offer wooden lotus table lamp, wooden home decorative light, handmade designer wooden light, decor wooden floor light, globular wooden slitz hanging light and suspended lights from India. Unimaginable work of pine wood in the form of lotus flower. The leaves handcrafted of pine wood in an innovative manner to filter light through them and the warm white light of the lamp reflecting elegant and enigmatic spacing of the leaves. From the first day of our inception, we manufacture and export the best quality of Wooden Home Decorative Light. The best wood is used for manufacturing the wooden home decorative light in accordance to the latest market trends. Its alluring appearance and distinctive design, makes wooden home decorative light ideal of interior decoration purposes in hotels and restaurants. 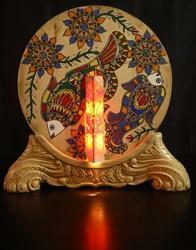 We are counted as one of the leading manufacturers and suppliers of Handmade Designer Wooden Light. Ideal for interior decoration purposes, the rendered handmade designer wooden light is known for its alluring appearance and elegant design. Known for its termite resistance finish, the quality of the handmade designer wooden light is never compromised. This Decor Wooden Floor Light is a floor lamp piece with a unique spherical ball with slitz and artificial flowers. The ball is made of pine wood and filters light beautifully due to rich resine contents. The mosaic pattern formation looks fabulous during day time and when lit its beauty increases exponentially. 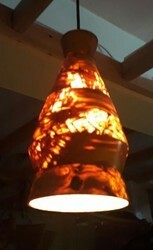 A unique wooden light piece in the floor lamp category. 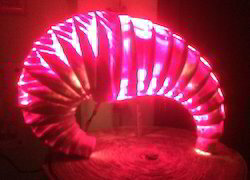 Since inception, we manufacture and export the best quality of Decor Lights. 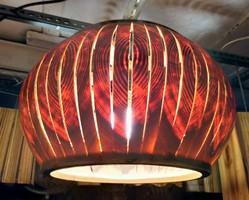 The best wood is used for manufacturing the wooden home decorative light with new trends. Its alluring appearance and distinctive design, makes wooden home decorative light ideal of interior decoration purposes in hotels, resorts, restaurants and high-end villas. This Globular Wooden Slitz Hanging Light creates great ambiance when energized with warm white LED light. The pattern on each slitz result into eye-catching mosaic formation. Being the market leader of this domain, we manufacture and export premium quality of Ambient light . Appreciated for its alluring design, resistance against termite and perfect finish, the rendered Arabian pinewood lamp is used in interior decorative applications. 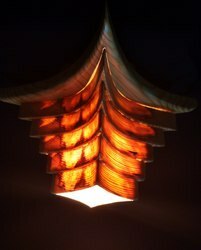 To meet the precise needs of our clients, we render the Arabian pinewood lamps in various designs. 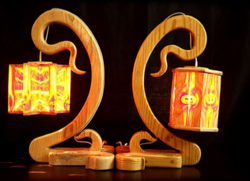 Leveraging on our rich industrial exposure, we have established ourselves as an eminent organization involved in offering an excellent array of Wooden Designer Lights. These lights are stringently tested on various parameters by the quality controller to ensure their quality. Offered lights are widely demanded in the market for their alluring appearance and fine finish. Further, the offered lights are available at market leading rates. We are prominent organization involved in offering best quality range of Stepping Stone And Tower Wooden Decorative Light. The offered light is manufactured by our skilled professionals using optimum quality raw material in complete adherence to the set industry norms. The offered light is highly appreciated by our clients for its superior finish and durability. Further, the offered light is strictly checked by our experts to ensure its quality and flawlessness.